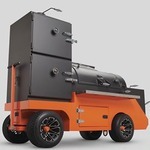 Yoder Smokers Community Forum • View topic - What??? No mention of dessert cheeses? What??? No mention of dessert cheeses? I thought smoked dessert cheeses would fit here. The right smoked cheese, a plate of fruit, and a bottle of port. Could be a wonderful dessert. Re: What??? No mention of dessert cheeses?